Esmokes - no not again! Comfort/Security are important when you enter new ground, and vejping are really a jungle when you are getting your first equipment. Esmokes was my choice of supplier cause it was a Swedish store and I wanted to be sure of a safe and fast delivery, and help if something broke. Esmokes delivery-time was not any better then buyin from a web-store in any other European country, so that argument fell off right away. Now when my mod stopped working properly after only about 150 days of vaping and I contacted Esmokes about it they told me there was a 2 month warranty, no offer to trade, repair or any kompensation at all. Only a few suggestions I should buy a new batteri and replace the build-in battery that I´m not even sure is the problem. Might as well be the data-chip in the ecigarette. To start with I only tested the mod at 30W a few times, and rest of the time I only used it at 15W. I´m not a cloud-chaser, I´m only taking smaller puffs mouth to lung here and there to simulate cigarette-smoking. To have some throat-hit and taste the aroma in the ejuice. Suddenly one day display says battery is empty every time I push the button even thou the battery was half-full. And every time I put the cable for charging in it says the battery is full. Sometimes after loads of on/off and taking the cable in/out 15 times I can get it to work. Sometimes it then works for 2 minutes, and sometimes 5 hours before it goes on strike again. I stopped smoking tobacco, and what that means for my health is the best present my girlfriend could give me when she paied for my first ecigarette. 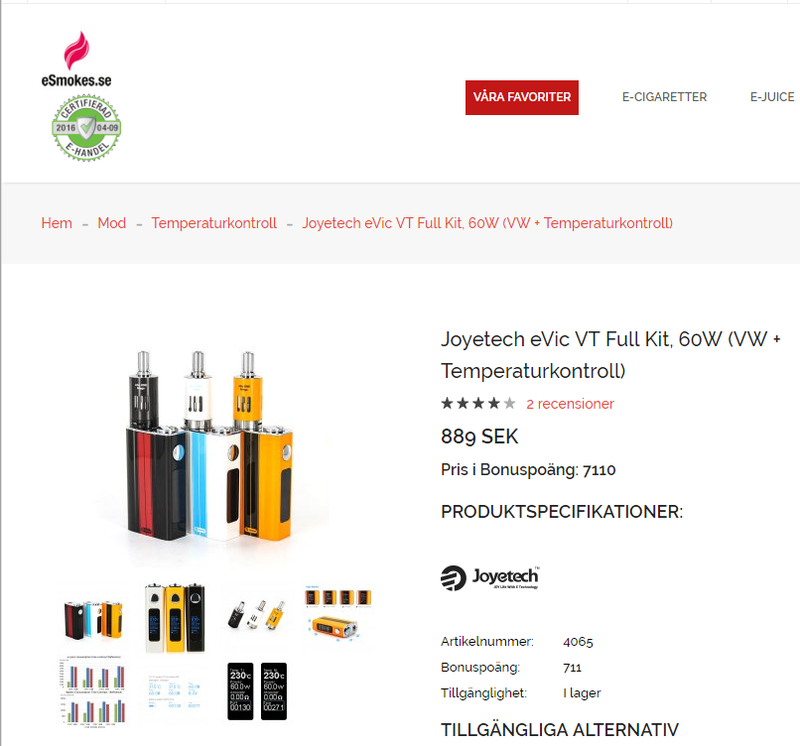 When my Joytech eVic VT worked I was satisfied with it. But standing here with no product despite what I payed, with no kompensation from Esmokes what so ever don´t feel so good. And after all I read about this model and its battery now, apparently its not that good and its said that Joytech has not ben truthful about its content. Maybe the model shouldn’t even be on the shelves for sale? Esmokes sold me my first ecigarette, a Joyetech eVic VT Full Kit, 60W for about $80. My future mods I will get from other suppliers.